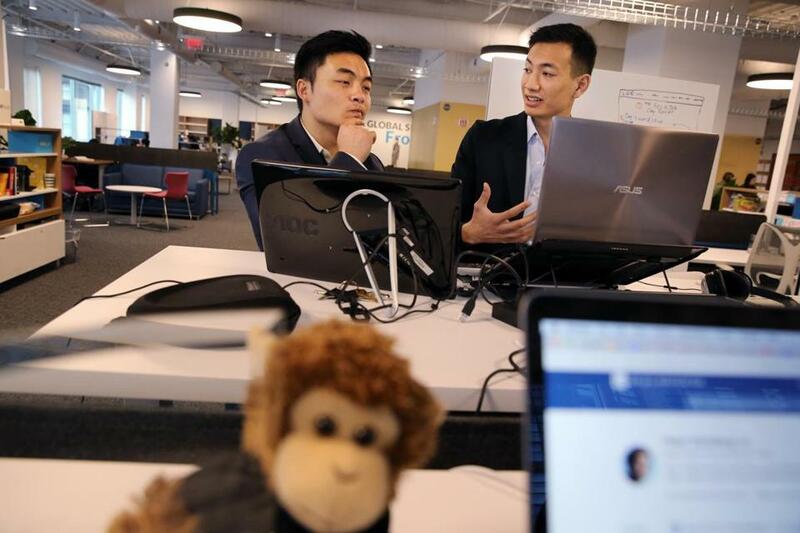 Scholar Jet cofounders Joseph Alim (left) and Tuan Ho pose for a portrait at the GSV Lab in Boston. Every February, the National Football League holds a scouting combine in Indianapolis to evaluate a few hundred college football players who may get drafted by a team later in the year. College standouts run the 40-yard dash, bench press 225 pounds, and get tested for agility. Boston needs to create a scouting combine for collegiate entrepreneurs. Before they grab their diplomas and take their skills somewhere else, we should offer them a chance to showcase their ideas and abilities to local investors, get feedback, and perhaps receive an offer of initial funding or free office space to keep them in town. February wouldn’t be a bad time of year, either, before students have gone too far down the road of planning their post-campus existences. What’s the problem that needs fixing? While we can lay claim to a robust startup ecosystem, there’s also a long list of “ones that got away” — companies that have created hundreds or thousands of jobs and generated an incredible amount of wealth in other places. That money doesn’t just go into yachts and vacation homes; it’s also donated to nonprofits and invested in the next generation of entrepreneurs. The list now includes companies like Microsoft and Facebook, the online file-storage service Dropbox, and Stripe, a supplier of technology for online payments. Most venture capitalists who funnel money into fledgling companies believe their campus scouting activity works fine. Firms like Highland Capital Partners in Cambridge host student groups in their offices or fund fellowships on campus so students can research technology topics of “mutual interest,” says Highland partner Dan Nova, and potentially make introductions to other entrepreneurially-minded students. Spark Capital, a venture capital firm in Boston, recently engaged a Harvard undergraduate to look for investment opportunities there. “It’s a new initiative,” explains Spark founder Todd Dagres. “We decided we needed to be closer to the students. We wanted to see things earlier and not miss things.” The firm supplied early capital to Twitter and Cruise Automation, a startup developing autonomous driving technology that was acquired by General Motors in 2016. The Cambridge venture capital firm General Catalyst oversees Rough Draft Ventures, a constantly changing group of current students that makes small investments in student businesses, using General Catalyst’s money. Those efforts are commendable, but they tend to focus on the schools that already have track records for generating scads of startups — MIT and Harvard. Even college entrepreneurs who raise lots of venture money — despite not having MIT or Harvard connections — say that the degree of difficulty is high. Since its founding in 2012, Drizly has raised $35 million from investors, including Boston-based Polaris Partners, and now employs 80 people. Like Rellas, Michael Vega-Sanz says he “found it extremely difficult to connect with VCs.” Vega-Sanz is a Babson student who recently put his studies on pause to focus on a startup, Lula. It is developing a person-to-person car-rental app. He says he was able to get some investor meetings “by simply sending cold e-mails.” He managed to raise $620,000, and is in the midst of going after more. Tuan Ho, cofounder of the startup Scholar Jet, earned a mechanical engineering degree from Northeastern University this spring. Scholar Jet enables companies to promote themselves as prospective employers by offering students what Ho has dubbed an “action scholarship,” based on a project the student has completed. It’s an alternative to filling out an application or writing an essay. Ho has funded the company with a $30,000 grant and about $60,000 he has collected at various business pitch competitions. He hasn’t raised any venture capital funding. So how could we change the status quo? An approach like a scouting combine — getting everyone together during a particular week of the academic year — could focus both students’ and investors’ attention. Make it open to student founders with anything from a rough prototype to a business that’s already up and running. Hold the event at an easily accessible venue like the Hynes Convention Center, and encourage lots of one-on-one meetings between students and investors, as well as informational sessions run by more experienced entrepreneurs sharing their perspective on company creation and the fund-raising process. Repeat it every year, and it would build momentum, pulling in more students and investors from farther and farther outside Boston. Not everything would be an idea worth funding, and not everything that turned into a startup would necessarily put down roots here. But Boston benefits from the magnificent magnetism of dozens of colleges and universities that attract some of the smartest people from around the world. We can do better at persuading more of them to stick around and build businesses here after graduation day. Getting help from our region’s top investors, and involvement from lots of schools — rather than having everyone continue to pursue their own independent strategy — would be key.